Skype is a wonderful communications tool, fast and generally a very efficient mode for talking to friends who live hundreds or thousands of miles away. More importantly it is a free service. During the week I received a skype call from New Zealand, a friend who left the Emerald Isle to make longish visit there. After us making the usual comments to each other, a question was asked that tweaked my pagan understanding of life. Q. What is Hell ? There followed statements by me which I now reiterate here. To me both Heaven and Hell are situations that we can find ourselves in on earth. For example: Hell may very well be a marriage, relationship or a situation in which we are totally unhappy and due to the prevailing circumstances are unable to extricate ourselves from. Staying in such a relationship is hell as the health crumbles from negativity that surrounds us. Q. Well what about Heaven? Heaven is the complete opposite of Hell. It is being in a marriage, relationship or a situation in which we are extremely happy, which we work at continually, because we never want it to end. What exists in between the two poles of Hell & Heaven are life experiences. And before you ask: Paradise is Planet Earth along with all of it's faults or imperfections, because just as the earth is not perfect nor are it's inhabitants. Q. Well what about after death ? If any person tries to tell you about 'after death' they are talking crap because nobody actually knows, no person has any experience or knowledge of this. It is pure supposition and mostly based on religious fear. Yes, there are those who can tell you of their experiences of dying during an operation and of their return; even so that in its self is not the same as being dead. What I do know is that there is some sort of existence and I have yet to meet anyone who has any precise knowledge of what it is and nor have I.
Q. What are your beliefs then ? I do not have any beliefs. What I do have is: the experience of living and the accumulated knowledge from my observations of life and learning. Beliefs are not based upon fact, they are mental assumptions of how we would like/expect things to be, they are mostly false notions. 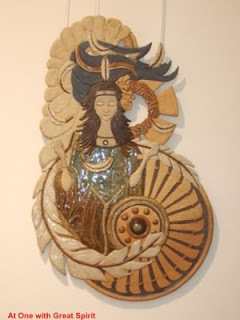 Q. I know that you have your own take on God, but what about the many Gods & Goddesses, how do you see them ? I see them as the archetypes within the collective unconsciousness and my own take is that 'God' is primal energy which I refer to as Pip. I find that the word G O D does not for me totally express all that I would like it to - when meaning that which created the world, this planet the universes and planets of outer space , etc. That word G O D has been sorely misused, to such an extent that it now has connotations of the dominant Patriarchal Society that has ruled high and mighty over women (and men) for three and a half thousand years from the Judaic to the Christians. Neither do I want to use the word G O D D E S S for that could be seen as a retribution. To me that which created and made physically manifest this world of ours, is far beyond even the High titles of Goddesses and Gods of the Celtic pantheon,or other pantheons for that matter. Years ago I studied the Cabala looking in at it as a methodology, a tool that can be used much the same as Algebra in maths in quantifying 'x' . I found that with the cabala one could insert into its structure literally anything. I insert it into the top sphere of the Cabala PIP a sphere from where the energy flows up & down the central line, as well as horizontally and diagonally; for the cabala is a totally integrated structure. In the two spheres beneath the singular energies of Positive and Negative, then down from them the Feminine and Masculine in their highest state. Following that the animal, plant and mineral dominions, followed by the deities of Gods and Goddesses, next the attributes of the deities and then woman and man followed by their indivi-duality. It gives me pleasure to share the photographs of just six items from Lucy's exhibition with her kind permission . 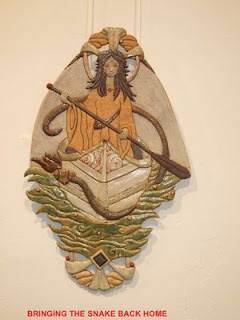 The Pictorial Arts fascinate me, particularly visual displays, whether they be paintings or sculptures. Photography films/videos I can leave beyond the door of my mind, their themes are too rigid for me. Take me to a gallery, lead me into another world, the world of patterns and dreams. There leave me to seek my own world, to find an interpretation that is singular and unique to me alone. To reach an inner understanding that speaks to my soul and connects me to that which is portrayed in front of my eyes. Such is my relationship formed with the works of artists and the spirit of their interpretations. Ballet, modern or classical, does the same to me as does the music. It is all there shapes, colours, movement, rhythms and sound; it leads me away into another dimension where my spirit uplifted soars free beyond the mundane. 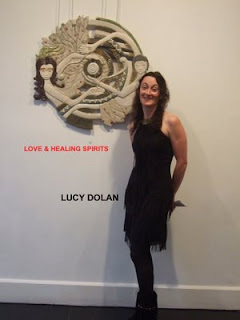 of Lucy Dolan's exhibition 'Soul Sight' in The Garter Lane Gallery, Waterford city. 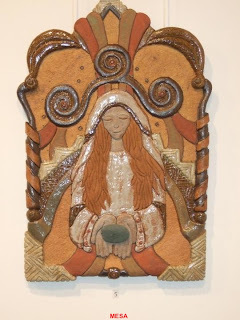 For her works similarly moved me out and into sempiternal space, to dwell upon the textures, glazes and colours, shaped to the composition of each piece. I was in awe, all was pleasing to the eye and yet each demanded that extra attention be given by the viewer to gaze for a 2nd, 3rd & 4th look, to think, dwell upon and meditate. I would live with each of them had I wall space and room! 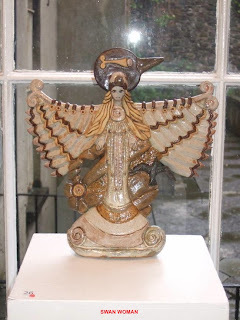 A surprise invitation arrived a few days ago from a friend, who has an exhibition of her ceramic inspirations, being held in Garter Lane in the City of Waterford. So this evening will see us driving to this famous waterside city especially to see the exhibition called Soul Sights. Waterford is mainly noted for crystal glass ware and differently, for me especially it hosts a retailer of Belgian Chocolate. For those mouth watering delights, I have been known to drive for two hours merely to indulge my taste buds. Switzerland is another country also known for fine quality chocolate, that fact leads me on to Tuesday of this week. When a Swiss friend Ms. CW arrived on our doorstep for a visit; We had last seen each other during the summer of 1996. Unlike myself she had no visible facial changes, I had brownish hair then and now it is almost silver. Our talks were as you can imagine on all manner of subjects, including the afore mentioned dark delight. To which CW diplomatically agreed that yes Belgium is also a chocolate country. Which will no doubt satisfy Marie P. a young friend of mine, whose culinary skills as a chocolatier produces a wonderful Belgian chocolate mousse, which she gives to her friends at Midwinter, a cheery dish whose every spoonful encourages me to have more!I Do hope that Marie is reading this and if ever she needs a reference, then my mere memory will effuse regarding her superior skills and beauty. 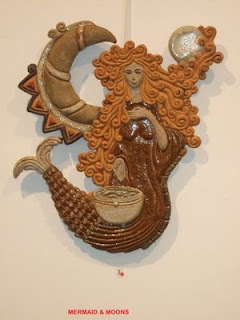 To be honest I have to admit that the Goddess of Goodness has given me many talented friends, companions and acquaintances. For only last Sunday when visiting The Farmers Market at Emo, Co Laoise. I met Sheila behind a stall named The Druids Pantry, (hadn't seen her for years) another talented person with culinary skills that whetted my appetite and I came away loaded with wonderful Dips. Namely Smoky Red Pepper Pesto, Caponata - a aubergine & tomato spread and a great Hummus containing Lemon & Corrinder - thus Sunday lunch for this veggie was sorted. 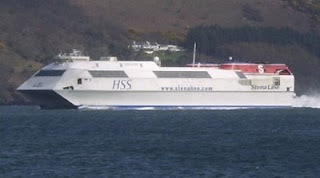 On a vessel built like an aircraft with all the luxuries of a ship, we sailed from Belfast to Stranraer in total comfort sitting on the Port side in The Quiet Area. A perfect position in which to enjoy the seascape of the North Channel; that strip of water that separates the north-eastern part of the island of Ireland from exotic Scotland. Our Host greeted us warmly and drove us safely to our secret destination, several miles further south close to the Solway Firth. Along the route buzzards sat on roadside as if by way of a greeting. The sky line showed small mountains or large hills, whose tops were shrouded in cloud that glowed with the twilight blue of near dusk. 'It's getting dark' I said to which mine Host replied 'This is as dark as it gets and there is always light to be seen in the Northern sky' That proved to be very true. exploring the secrets of the grounds as well as the house its' self. 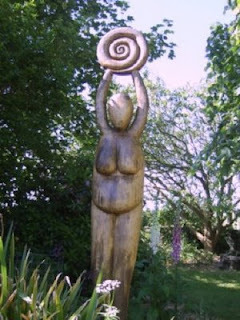 Later, in a sheltered area out of sight from road or drive, I found 'Her' amongst purple and white lupins, a giant sized Earth Mother, carved from a single piece of wood. Her placement was exactly right, for she neither commanded nor was she swallowed by her surroundings. The fields at the rear of the property abounded with wildlife. Buzzards swooped over a nearby woodland, Roe Deer pranced across the open plain to leap gracefully over a burn (stream) as a pair of Hares dined daily on the sward. In the garden small brown birds pecked nuts from a feeder, joined occasionally by a pair of Doves and a solitary Woodpecker. We were gifted in having a delightful beach within a four miles of the house. The approach to it was via a gated road, reminding me of an earlier visit to the Highlands, where such road gates are common place. The beach was mainly pebbles of various sizes with only a small strip of sand visible at half low water, with lots of seaweed attached to the rocks at either end of the cove. We found a grassy knoll to sit on and have a picnic, which gave us a good view of a large uninhabited island, uninhabited that is apart from a Red Deer nibbling on seaweed at the waters edge. 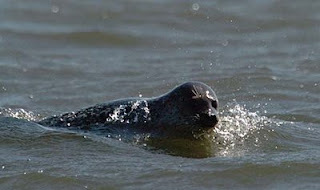 A few minutes later our attention returned to the sea, for a brown Seal had surfaced to swim in towards the beach. It's colour indicated the probability that it was a young male and it looked to be about two metres long. Well, we were obviously not what he was looking for and he soon disappeared beneath the waves. My companions ventured on to the sand to paddle knee deep in the sea, as I sat day dreaming enjoying the warm sunshine. In no time at all I realised that my skin was starting to burn, fortunately there was a remedy close at hand. 'Bladderwrack' a greenish seaweed with pimpled bubbles. When placed in the palm you burst them and apply to the skin, they provide a jelly like film that prevents sunburn. These I applied very liberally to all of my exposed areas. My next duty was to demonstrate this to my companions, so that they might partake of the preventative. The holiday ended all to soon, the child within me did not want to leave and it was only the thought of another trip on the Seacat that kept me happy. So on my first day back I very much begrudged being back at home. The sign of a good holiday!